Ed Byrne doesn’t like doing interviews. After two decades of being probed interminably by journalists of every stripe on every detail of his life and work, the Dublin-born comedian could perhaps be forgiven for his media weariness and wariness. This however, is not the true source of his aversion. In an opening gambit to his new show, Spoiler Alert, he explains that he feels most free to be himself on stage, whereas in interviews he is afraid to speak his mind and is more guarded than he is comfortable with. As he points out over a post-show dinner: “There’s very little I could say in an interview that is more open than I’ve already been on stage”. Certainly, when Byrne is treading the boards he appears to bear his life and soul to houses that are now almost inevitably packed-out. The intimate setting at the Edinburgh Fringe, where Spoiler Alert kicks off before its eight-month run across the country, seems particularly amenable to the observational comedy for which he is renowned and, indeed, is most often described as ‘master’ of. 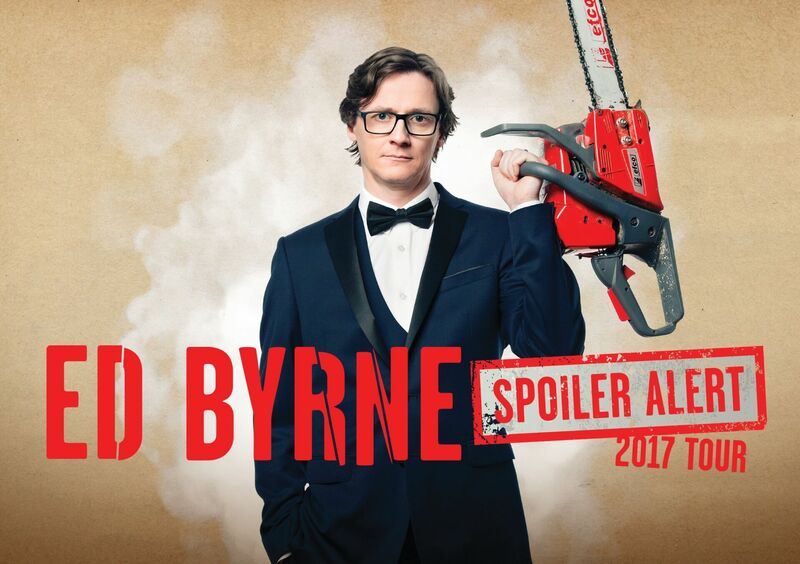 The sold-out show may be packed to the rafters but Byrne’s warm, affable humility, self-deprecation and confessed bewilderment at modern life in general endear him to, it seems, every member of it. There will be no spoiler alerts here but, suffice to say, the collective nods of recognition and hilarity as he runs the gamut of a vast array of subjects, from his sons’ trampoline to running out of petrol, strike a chord as well as an instant rapport with an appreciative audience. Byrne’s easy-chatting stage style makes it easy to forget he is a consummate performer; so much so that whether art mirrors life or vice versa becomes impossible to gauge. Even the perils of muddying such waters become a mine for laughs. As Byrne points out, when all one’s world is a stage relationships with friends and family can become a fraught as well as funny business. Just when you think he’s rambled off track on a rant, though, he punches back with an erudite, witty one-liner that reminds you just how skilful and seasoned a comic he is. The show’s premise is that we have all become spoilt and, as we have come to expect, Byrne turns the spotlight on his own bafflement at all the trappings of middle-class life that a successful career bring. Far from settling him into a comfortable existence the benefits of such a lifestyle are accompanied by angst aplenty for someone who has always felt something of an ‘inbetweener’, an outsider seemingly in all circles. Byrne’s tour titles such as his 2009 Different Class and 2016’s Outside, Looking In, may be telling in this respect. Byrne’s journey has seen him transported from an aspirational working class background to the realm of middle-class ‘celebrity’ – though he may wince at the epithet – in which he is equally a misfit. His father started out as a sheet metal worker and became a supervisor, while his mother began as radiographer and became a lecturer so he has always felt his class position to be anomalous. John Lennon’s Working Class Hero captured this conundrum of class and social mobility succinctly with ‘They hate you if you’re clever and they despise a fool’. Of course, it is precisely by playing the fool that Byrne has propelled himself to the dizzy heights of comedy stardom and if the outsider sees most of the game he has turned this to his advantage in an enviable career. After stepping onto the stage as a student 20 years ago he now graces screens big and small as stand-up, actor and writer. He has certainly become a household name, as a stalwart on shows like Mock the Week and Have I Got News for You and with appearances on Comic Relief and countless others on tv and radio; documentaries including this year’s Dara and Ed’s Road To Mandalay with fellow comedian Dara O’ Briain and a string of sell-out tours under his belt – not to mention an eight-year stint as the voice of Carphone Warehouse. Yet, as he tells his Spoiler Alert audiences, fame and fortune and everything that goes with it still leaves him a stranger in a strange land. The life he is thereby able to give his children, for instance, is something of a double-edged sword, in that they have everything he did not, yet this frequently places him at odds with the middle-class beings he is nurturing. There is something, if not quite wrathful, wistful about a world that has seemingly become so soft-soaped and protected it may no longer be brave enough to feel and think for itself. A life with no hard knocks and sharp edges may be in danger of becoming a duller shade of pale – not shrieking one’s offspring away from electric fences could be wise parenting after all, Byrne muses. In any case there is much merriment to be had in the bizarre workings of what now epitomises the bourgeois hearth and home, the Aga, particularly when one can’t even pronounce it without sniggers. At the same time, on the other side of the class divide, he is incredulous that he has been accused of selling-out to celebritydom by naming his son Cosmo. Nevertheless, he tells me after the show that although aspiration can be a source of conflict he remains firmly committed to it. He says: “I’ve always thought aspiration is a great thing; I find it ridiculous that someone can be accused of being too intellectual or too aspirational. The idea that those words could be used as insults is ludicrous. How on earth can having intellect be a bad thing?” He sees this as part of a trend towards an anti-intellectual, anti-expert culture that has culminated in the rise of the likes of Donald Trump and Nigel Farage. The illusion, or delusion is, he points out, that these figures are down-to-earth and driving a resurgence of power ‘from below’. It is essentially part of a suppression of freedom of speech and expression, one that he identifies and deplores as a feature across the political spectrum, including of the avowedly liberal and left-wing. The secular organisation was founded in 1896 and, now some 60,000 members strong, works to create a free-thinking, tolerant world and social change through its campaigns and providing humanist ceremonies and pastoral and education services. Byrne is particularly keen to support fundraising for its vital pastoral and chaplaincy work. He is incensed that in prisons and hospitals, for instance, the support offered is overwhelming religious, whereas non-faith support is woefully inadequate, despite the fact that prisons and the NHS recently recognised inmates and patients had a legal right to request a humanist pastoral visitor. He says: “What Humanists UK really need is money, so they can provide pastoral care to people in situations where they desperately need it but may not want the religious-based support that’s offered as a matter of course.” Humanist pastoral support workers are volunteers and work across hospitals, prisons and the armed forces. The organisation aims to enable every person who requests humanist support to get it but it relies on charitable donations and pastoral campaigns and training are costly. Byrne’s other lofty passion in life – this time quite literally – is hillwalking and here too he has aspirations to conquer some dizzy heights, in the form of Munros. He declares proudly that he is a Munro bagger with ambitions of claiming the title of Munroist. A Munro is a Scottish mountain over 3,000ft and there are 282 to conquer before one can bag the Munroist crown – Burne has notched up 80. Even here, though, he cannot quite escape the media storm, as he discovered when he hit the headlines earlier this year after ‘rescuing’ a hillwalker in the Cairngorms. He deflates this particular act of heroism when he tells his Edinburgh audience he was shocked and not a little amused to find himself splashed sensationally over the front pages simply for lightening a fellow walker’s rucksack load. The lifelong horticulturalist doesn’t come across as a placard-waving eco-warrior as such but his love of nature and his fears for the environment undoubtedly poke through the humour in Spoiler Alert. In a sally aimed at how micro beads in face scrubs are harming the oceans, for instance, wit only barely conceals the force of his ire. Out-and-out rage is not quite his style, though. The chainsaw he weilds on the promotional shot for Spoiler Alert might recall Slim Shady hell bent on slashing through society’s raw nerves but Byrne’s is, he quips, the one he uses in his garden. Nevertheless, his wry wit deals a hefty prod to an array of social mores and the seasoned Fringer finds Edinburgh as edgy a place as ever to start his tour. He rejects the popular moan that the festival has become commercial and consequently more polished as a romanticised dose of nostalgic amnesia. Rather, he insists, it has always been commercial and is as chaotic and cutting-edge as ever, perhaps more so. This festival has thrown up a couple of surprises that he takes with him on tour, though. Firstly, he admits to being shocked at the number of youngsters going to his shows. One might expect comedians to take their audiences with them as they mature and while this is true, Byrne says: “I always go out and look down the queue outside the venue before the show and I’ve been gobsmacked to see that while we set out mainly with the older audiences, we are now seeing a lot of youngsters coming too, which is fantastic”. Having a sign language interpreter for deaf audiences has also added an unexpected dimension. Initially he worried it might throw him off his stride to have another person on stage but it turns out that the interpreters have become part of the act, even stars in their own right. Byrne tells me they have discovered people will go to see a particular show specifically to see a favourite interpreter. Undoubtedly there is a rapport between the two on stage; it is almost a double act – as Byrne admits the sign for Donald Trump is funnier than anything he could’ve come up with. Byrne doesn’t poke fun at anyone in particular but alerts us to the fact that we’re all spoilt for choice when it comes to modern life’s conundrums, which look set to provide a rich store for comedy for some time to come. He is perhaps not so much wiser with age as with the knowledge that we need to laugh at our own ignorance and bewilderment – and that may be his most humble and human insight of all.